I just got back from an amazing blogging conference called Blog U.
I was there in the capacity of “Design Lab,” which was a brilliant idea by the conference creators to offer a help desk for bloggers. They could schedule a 20 minute session and discuss any questions they might have. I have been humbled hearing the feedback from the conference, and I have benefitted as well. I received a clearer understanding of how many different levels of WordPress knowledge bloggers actually have, it reinforced my “assume nothing” position. I wanted everyone I spoke to, to understand that it doesn’t matter what level of understanding you have. You are awesome. And it is amazing that you want to know, and you can know! You are so much more than you give yourself credit for!! I often accuse myself (people can do that you know) of giving my knowledge away for free. But it’s that “teach a man to fish” mentality. There are so many things a blogger can do for her/himself without paying someone, with a uniterrupted hour and a good tutorial, you’d be amazed at what you can accomplish. And if there’s a really big problem, then you can come to me. For some people getting into the backend of WordPress can be intuitive work, and they just dive in. While other people are unsure what to do, and have heard enough horror stories to make them scared to touch anything. I hope by reading this blog, you will learn that you don’t have to be worried. And if you have backups of all your work, you are always good to go! While at BlogU I noticed more sites than I would have thought, without active Akismet accounts. Some of those sites had turned their comments off because they had so much comment spam. Akismet is probably the most important plugin you can have. This is the single most effective plugin for blocking comment spam. It is so perfect, it comes pre-installed with Jetpack*. But it doesn’t come pre-setup. So I am going to help you set it up if you haven’t already. 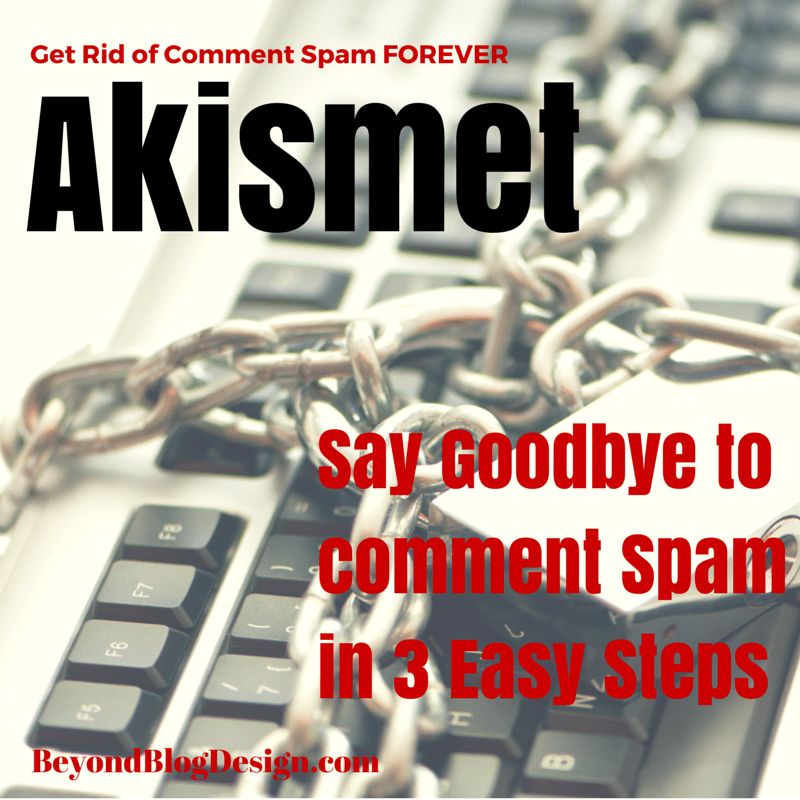 Akismet is one of those plugins that is purposefully setup to integrate nicely with Jetpack and WordPress. To that end, you can locate it by clicking on Jetpack>Akismet. WordPress, as Jetpack, already knows who you are. You should continue your login using the email that pops up unless you have a very good reason not to. When you click on this link you will go to Akismet’s setup page. It will ask you what type of plan you would like, choose “Basic.” Now here, you are lead to believe that you have to pay for Akismet. There is a sliding scale, you may slide it to $0 if you choose. However, because they created this amazing and wonderful plugin that you cannot live without and will save you hours of heartache and strife, how about giving them a $1.00? Once you enter the amount you will be given an API key. Your Akismet should now be automatically active! 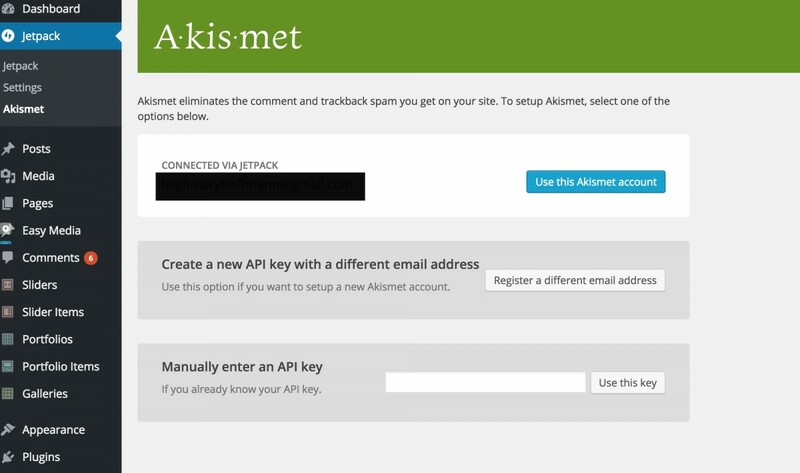 If for some reason it isn’t, all you need to do is go back to where you should have Akismet open in your dashboard (or go back to your dashboard and click Jetpack>Akismet) and enter the API key, click Use This Key, and you are good to go! 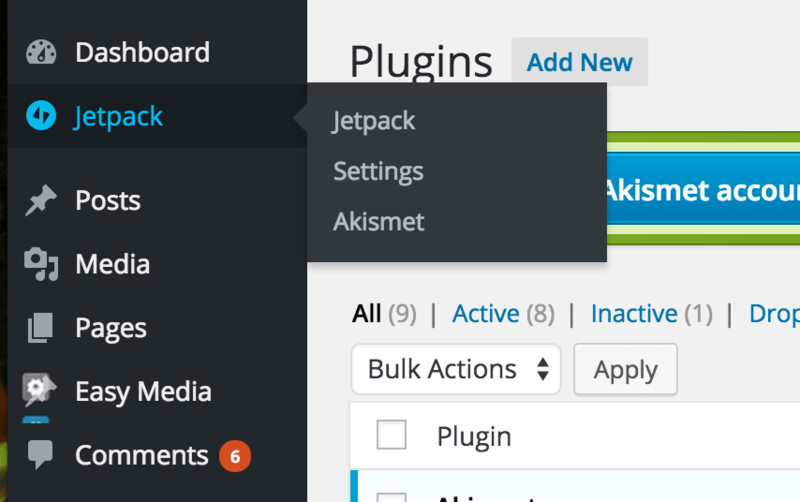 *If you don’t use Jetpack, you can install Akismet, by going to Plugins>Add Plugin, it will show up right there at the top of the list. Install it and activate it, from now on you will find it in Settings>Akismet. And then follow the same directions! As always, I am here to help! If you have any questions don’t ever be afraid to ask! Thank you so much for sharing this wonderful article, Jen! It was extremely helpful! A very good blogger friend gave me link to this article as it helped her a lot! Running a business myself too and it is just ULTRA annoying with all these spammy comment links. At one point of time I really wanted to disable comments on my blog. It is good thing i didn’t and happened to have read this. Your article helped me tremendously! Would love to read more of your articles !